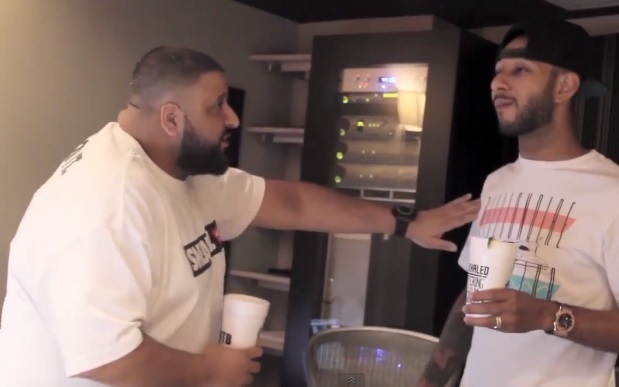 Here’s an interesting compilation of footage chronicling DJ Khaled’s journey to create his new single “I Feel Like Pac/I Feel Like Biggie” over the span of a few individual studio sessions with Swizz Beatz, T.I. and Meek Mill. Watch as the We The Best Music Group head honcho speaks on finally having the opportunity to collaborate with his long-time friend Swizz Beatz and begins the recruitment process to fill in the verses on his new smash song. Go behind-the-scenes to see how it all came together and the type of work ethic that a single track can require. This entry was posted in In The Studio, Miscallenous, Video and tagged DJ Khaled, hip hop, i feel like big, I feel like pac, rap, studio, swizz beatz, we the best music group. Bookmark the permalink.